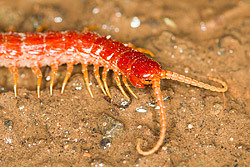 The Myriapoda is split into 4 Classes: Diplopoda (Millipedes); Chilopoda (Centipedes); Symphyla (Garden Centipedes) and Pauropoda (not illustrated here). 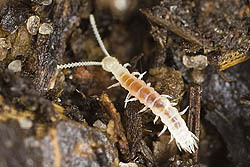 As their name suggests, they all have numerous pairs of legs (minumum 9 pairs; maximum 375 pairs). 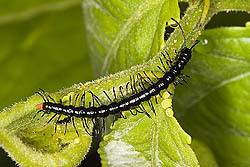 There are about 13000 described species worldwide.